Every girl needs a great pair of jeans! In the summer that transitions into needing a great pair of white jeans! I have been on the hunt for the last few months for the perfect pair and here are four that I've found and wanted to share with you! From the affordable classic to designer denim, I truly believe everyone can find their perfect pair in their perfect price range. When you're looking for the perfect pair go in with an open mind and don't settle for a pair that don't fit you great. White jeans have a reputation for making you look bigger, which makes sense, black recedes and white advances. Blah, blah, blah. White jeans can look great on everyone as long as you find your pair. For me, it's a jean with very little Spandex. The more stretchy fabric means less cotton and it allows the denim to stretch over the areas you might want to camouflage. Levi's Cropped 535 Leggings: You can't go wrong with the classic Levi brand! I love that this pair has the cropped ankle. I actively look for cropped pants for the summer time so I can show off all my cute sandals! I like these because the denim quality is really good and they're under $50! This pair falls right in line with my not-too-stretchy policy. 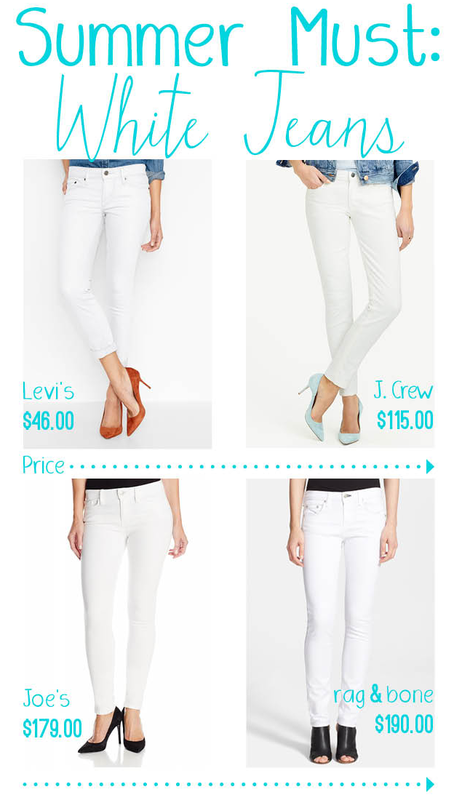 Joe's Stay Spotless Annie Jean: This pair of jeans is rather pricy at $179.00, but there's a reason for it! This magical pair of pants repels stains! It's a waterproof, spill proof pair of pants! For a clumsy person like me this denim technology is a God send. Red wine, coffee, black tea and other things that spill (Read: That I spill all the time) basically just wipe off! SO you splurge on this magical pair of pants and never have to buy white jeans again because they'll stay white! rag & bone Dre Slim Boyfriend Jean: rag & bone is one of my favorite companies. Their booties are to die for and I've never heard a bad thing about their denim. Yes, they are really pricy, yes you'll be dropping two hundred dollar bills on the table in exchange. But give up Starbucks for a few weeks (I know it would be tough), but then you have the spare cash and can buy this lovely treat! Also, I'm not a fan of super low-rise jeans and this mid-rise is just right!